Nick Sninkelletti was born in 1981 in the Gold Country of California and grew up in the tiny town of West Point (population 800). Nick spent his childhood exploring the wilderness as a Boy Scout, earning Eagle Scout rank by the time he was fourteen. Nick eventually went to college at UC Berkeley to study engineering, but after graduating, he had a change of heart about his career path. Brain surgery on his right temporal lobe helped free his right brain, allowing him to explore his creative side. Thus he discarded Autocad and spreadsheets in favor of a palatte & canvas. 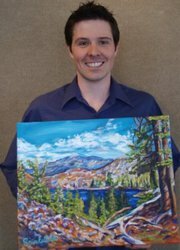 Back in the mountains around Lake Tahoe, Nick began a career as an art consultant at a fine art gallery. He started to devote considerable time and energy to his art and has gone on a flurry of creation ever since. He fell in love with a girl in a giclee printing shop named Selena and together they have continued to pursue their futures as fine artists. Thanks to Selena's degree in oil painting from Washington University, Nick has learned more about the technical side of painting that is so crucial to the longevity of a fine art creation. Sninkelletti enjoys painting subjects that express joy and beauty from a wordly perspective. He paints landscapes and cityscapes from photos he has taken in his extensive travels, both locally and abroad. Known mainly as a colorist, Sninkelletti's art has been referred to as everything from vivid impressionism to abstract expressionism. After less than ten years as a painter, Sninkelletti has amassed a large portfolio of over two hundred fully developed paintings. His originals and limited edition reproductions are available for viewing an purchase at one of the top family-owned galleries in the world, Marcus Ashley Gallery in South Lake Tahoe. Nick's circuitous path has ultimately led him to the world of philanthopy, working for the Bently Foundation. The Foundation's mission is to support charities working to improve the arts, animal welfare, and the environment. Purchase of one of Nick's paintings requires that 20% goes to one of the charities he has encountered through the Foundation. To read a more extensive biography of the artist, please view the "Sninkelletti Press" page of this website.